How we got involved with the Land Speed Record Steam Car. I first became involved with this project when Dr. Neil Richardson, a senior lecturer in the School of Engineering Sciences at the University of Southampton, asked me if I had any ideas for a group design project for his Master of Engineering students in 1996. The idea of a steam powered car to take the world record for a steam car which was 127.66 mph held by Fred Marriott since 1906 was put forward and accepted. Doctors Neil Richardson and Richard Bowen developed the idea and the first year 1996/97 was primarily a scoping exercise. The second years group 1997/98 completed detailed design study and carried out wind tunnel tests on a 1/5 scale model. In November 1996 Doctor Richardson took part in the Centenary London to Brighton veteran car run as a passenger in a 1903 Daimler from the Beaulieu Motor Museum, driven by the Hon. Ralph Montagu. During the run Dr Richardson mentioned the steam car project and in the summer of 1997 invited the Hon Ralph Montagu and his father Lord Montagu to the project presentation given by the students as part of their degree assessment. In order to progress the project further and to build a record breaking car, funding/sponsorship was needed. In the autumn of 1997 the Hon Ralph Montagu telephoned Dr. Richardson telling him that his cousin Charles Burnett III may be interested in taking on the project. Dr's. Richardson, Bowen and myself had a meeting with Charles Burnett III and the ball started to roll. Subsequently Glynn Bowsher was recruited as design engineer and the resulting car has now beaten that earlier record with a speed of 139.843mph. At the beginning the project was named Team Inspiration, the idea being to inspire young engineers to think outside the usual parameters and do something extraordinary. The car ended up with a two stage turbine and 12 computer controlled mini bore boilers. The concept was daring and bordering on the impossible but with sheer grit and determination the new record is now proudly held by Charles Burnett III. The car shortly after the final run on 26th August 2009. On Wednesday 26th August 2009 at 8.22am (California time) Don Wales successfully set another land speed record for a steam powered car. The car set the record for a measured kilometre – achieving an average speed of 148.308mph on two runs. After Charles Burnett III’s heroics on Tuesday 25th in breaking the record for a measured mile, test driver Don Wales piloted the car for the attempt at the kilometre record and reached a peak speed over 155mph. Both new international records are subject to official confirmation by the FIA. Land Speed Record Car. Picture Slide Show. Land Speed Record Car. Early Pictures. Land Speed Record Car. Early Tests. Land Speed Record Car. First Run Under Steam. 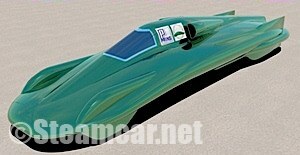 Land Speed Record Car. Base Camp set up ready for Record Attempt. Land Speed Record Car. Diary Page One. Land Speed Record Car. Diary Page Two. Land Speed Record Car. Diary Page Three. Land Speed Record Car. Diary Page Four. Land Speed Record Car. Diary Page Five. Land Speed Record Car. Diary Page Six. Land Speed Record Car. Diary Page Seven. Land Speed Record Car. Donation Page. Land Speed Record Car. (Model For Sale). Land Speed Record Car. News Letter Number One. Land Speed Record Car. News Letter Number Two. Land Speed Record Car. News Letter Number Three. Land Speed Record Car. News Letter Number Four. Land Speed Record Car. News Letter Number Five. Land Speed Record Car. News Letter Number Six. Land Speed Record Car. News Letter Number Seven. Land Speed Record Car. News Letter Number Seven May 2009. Land Speed Record Car. News Letter Number Seven June 2009. Land Speed Record Car. News Letter Number Eight. Land Speed Record Car. News Letter Number Nine. Land Speed Record Car. Pictures. Land Speed Record Car Sponsorship. Land Speed Record Car. 1906 Stanley Race Car.